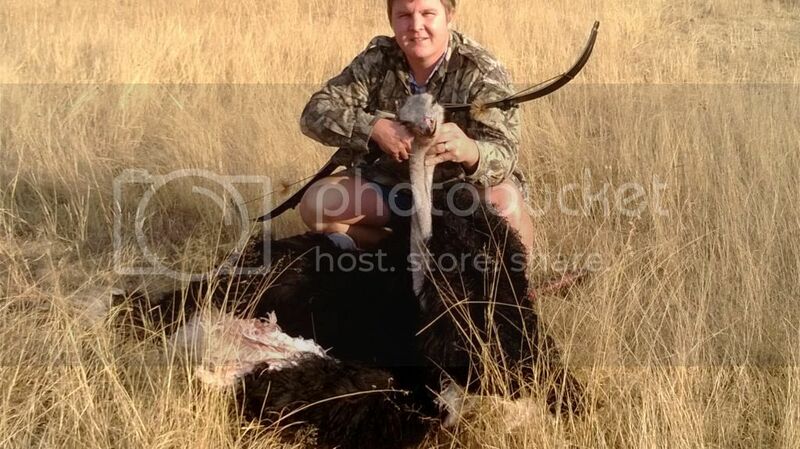 I bagged this male ostrich today. I was waiting in a blind for a warthog when this guy showed up. I shot him through the chest and he went about 56yards. the arrow passed through. That's awesome mate! I tried ostrich when in Africa and found it an outstanding meat. Also fine leather too. Nice Man, Does it taste like chicken? Yeah, way cool. That is high on my list for next time. Had a female try to climb in the Blind in June . Hit her several times with my hat and arrow. The PH finally grabbed a tree branch and beat her out of there. Guess she was looking for a handout. Or maybe she just liked me. LOL.